Sea Stars: Unstoppable Killers Of The Ocean? Most people call them starfish, a more accurate name to call them would be sea stars, but personally I prefer to call them terrifying reminders of my own mortality. My own personal prejudices aside, the reason “starfish” isn’t an accurate term is because they aren’t fish. They’re echinoderms, a group of marine animals that existed millions of years before the earliest fish evolved. Echinoderms are patient predators, they have used their millions of millennia on this earth to evolve innumerable little features that make them seemingly indestructible. Sea stars are as full of tricks as James Bond’s Aston Martin, and they use all of these tricks in their unending struggle for survival. The creepiest thing about sea stars is probably the way they eat. Sea stars have a mouth on their underside that is connected to their stomachs. They have two stomachs, a cardiac stomach which is a sort of sack-like structure that digests foods and a pyloric stomach that absorbs nutrients from their food. 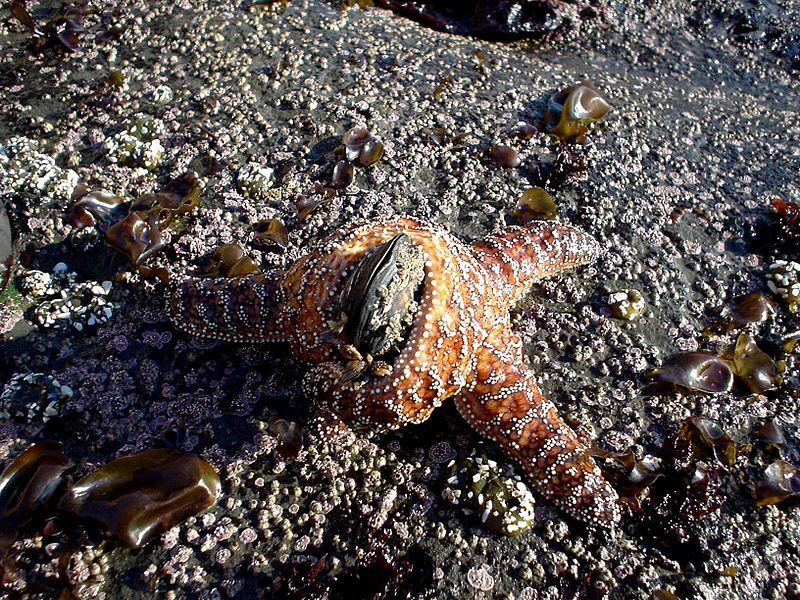 Most sea stars are opportunistic feeders, subsisting mainly by eating microorganisms and waste, but also preying upon other sea life. Different genuses of sea stars have different ways of digesting their prey. More primitive genuses will swallow their prey whole, partially digesting it in their cardiac stomach before spitting out the hard parts and passing the rest to the pyloric stomach. Other sea stars can actually excrete their stomach to digest larger prey. This trick is particularly useful when eating bivalves, whose shells are notoriously hard to pry apart. Sea Star is in process of consuming a Mussel. Photograped by Brocken Inaglory in Northern California. Source: Wikimedia Commons. For thousands of years, going all the way back to the ancient Greeks, it was a mystery how sea stars were able to eat mollusks, especially bivalves. It wasn’t until the latter half of the nineteenth century that the process was discovered. They use their extremely strong hydraulic vascular system (they use water to power their limbs) to pry open the shells of bivalves, sometimes cracking it open only a couple millimeters, then they excrete their stomach into the shell and partially digest the animal inside before slurping its remains up. Talk about home invasion! Some species of sea star, such as the crown of thorns star, eat coral in the same way. Coral isn’t a very mobile animal, once it’s built its home it pretty much stays there for good. So imagine this little guy, frozen in place, slowly being digested by stomach enzymes as a giant predator gushes its internal organs over it. Original description: Sea stars have what many might consider unusual eating habits. Rather than ingesting prey through its mouth, a sea star will push its stomach out of its mouth to begin feeding. This process is called eversion and is done so that the starfish can expose prey to digestive enzymes and begin its digestion outside of its body. The stomach will not be pulled back into the sea star’s body until the liquefied food has been absorbed through the stomach lining. 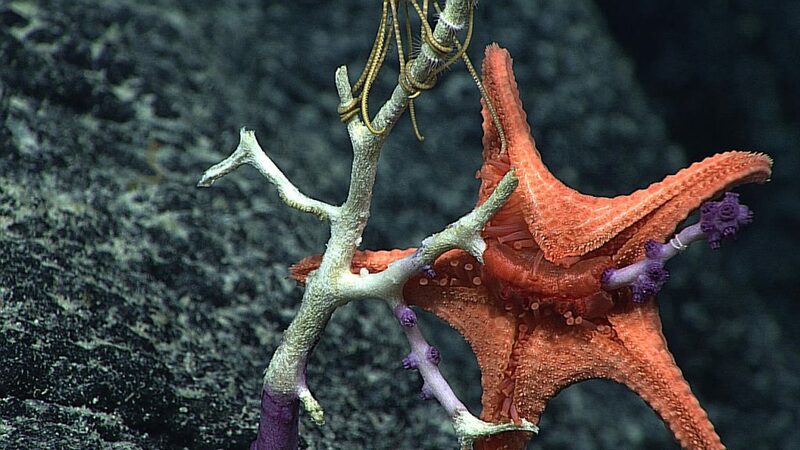 This image, taken over 2500 m deep, depicts a Circeaster pullus everting its stomach in order to feed on an unfortunate Victorgorgia coral colony. Seen September 21, 2015, during a dive investigating the northeast slope of a cone feature on an unnamed seamount within the Pacific Remote Islands Marine National Monument. Author: NOAA. Source: Wikimedia Commons. And killing a sea star is not a simple matter of stabbing them or shooting them. Many sea stars have the ability to regenerate lost limbs, and some can actually regenerate an entire body from a small piece of a single limb. These little creatures are more persistent than Michael Myers! For humans, our size is the only thing that saves us from the wrath of the sea stars. But although sea stars can seem very creepy, the reality is that we pose a much bigger threat to them than they do to us. The skin of sea stars is made out of a kind of network of calcium carbonate plates connected with living tissue (another kind of creepy thing about them: crystal skin) but as the acidity of the oceans rises due to increased levels of carbon dioxide in the atmosphere, their ability to form these plates is affected, leaving them more vulnerable. And without sea stars a lot could go wrong in the oceans. Sea stars have been called a “keystone species” because they help to regulate the population size and distribution of microorganisms in the sea. “Comet” of Linckia guildingi, showing starfish body regrowing from a single arm. Author: Emőke Dénes. Source: Wikimedia Commons. In summary, sea stars have a lot in common with aliens: they have crystalline skin, weaponized digestive systems, and can regenerate; also, as scary as they may seem, the thought of not having them around at all to potentially help us clean up this earth is even more frightening. This was a little bit yucky, but very interesting! My family sat together to read this article and watch the time lapse video of the worms and sea stars feeding and we were all mesmerized! Thank you HMNS for bringing this to us!